When upscale, happily unmarried San Francisco couple Kate and Brad find themselves socked in by fog on Christmas morning, their exotic vacation plans morph into the family-centric holiday they had, until now, gleefully avoided. Out of obligation--and unable to escape--they trudge to not one, not two, but four relative-choked festivities, increasingly mortified to find childhood fears raised, adolescent wounds reopened...and their very future together uncertain. As Brad counts the hours to when he can get away from their parents, step-parents, siblings and an assortment of nieces and nephews, Kate is starting to hear the ticking of a different kind of clock. And by the end of the day, she is beginning to wonder if their crazy families' choices are not so crazy after all. No one enjoys the holidays more than Brad and Kate. Every December 25th, this happily unmarried, upscale San Francisco couple embark on a holiday tradition they have shared every year since they met--ditching their crazy families for a relaxing, fun-filled vacation in some sunny exotic locale. There, sipping margaritas by the pool, they toast the season, knowing they have once again avoided the chaos and emotional fallout of their four respective households: divorced parents, squabbling siblings, out-of-control kids and all the simmering resentments and awkward moments that are the hallmarks of every family Christmas. Shorts and sunglasses packed, Brad (VINCE VAUGHN) and Kate (REESE WITHERSPOON) are trapped at the San Francisco airport by a fogbank that cancels every outbound flight. Worse yet, they are caught on camera by a local news crew, revealing their whereabouts to the whole city...and to their families. With no escape and no excuses, they are now expected home by Brad's father. Four Christmases in one day. As they brace themselves for a marathon of homecomings, Brad and Kate expect the worst--and that's exactly what they get. But as Brad counts down the minutes to their freedom, Kate surprisingly finds herself tuned to the ticking of a different clock. At the end of the day, each will gain a new perspective on where they came from...and where they're going. Getting to know themselves and each other as they really are could finally give them a chance at the kind of love they've only been playing at. New Line Cinema presents, in association with Spyglass Entertainment, a Birnbaum/Barber Production, a Wild West Picture Show / Type A Films. 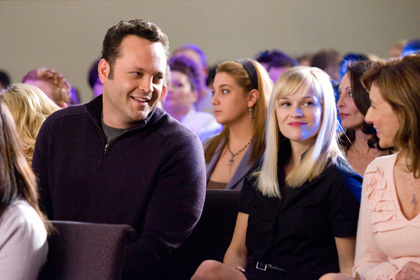 "Four Christmases" will be released domestically by Warner Bros. Pictures, a Warner Bros. Entertainment Company. It is rated PG-13 for "some sexual humor and language." Soundtrack album on New Line Records.